How things have changed in 50 years! This Sunday marks the 50th Super Bowl in NFL history, a league with more than 90 years under its belt. So, how did this game come to be since football has been in this country for more than four decades? The story of the first Super Bowl is a unique one that actually came out of competition between the old guard at the time, the NFL, and a rival upstart league, the AFL. Now five decades later, the game is one of the biggest sporting events in the world. With professional football's popularity on the rise in the late 1950s, the American Football League was founded in 1959 to compete and also to bring football to new markets. The AFL had teams in new areas like Houston, Buffalo and Kansas City, and were able to steal away top talent from the NFL. The two separate leagues finally decided to merge in 1966, but wouldn't play each other during the regular seasons for four more years (the merger was finalized in 1970). The two leagues did create a championship for the separate leagues to compete in and determine who was the best team that year. This began in 1966. The first championship game was actually called the First AFL-NFL Championship Game and became known as Super Bowl just one year later. 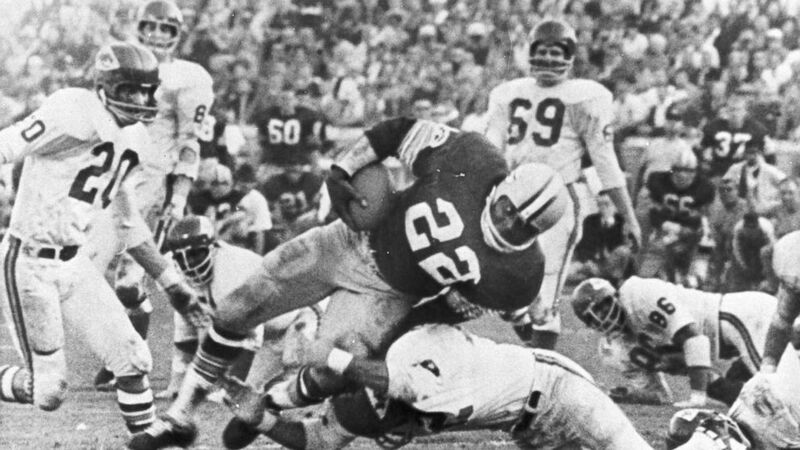 (AP Photo) The Packers play Kansas City at the Super Bowl game in Los Angeles in this Jan. 15, 1967 file photo. The first championship game wasn't even a contest as the resident champs, the Green Bay Packers and their legendary coach Vince Lombardi, crushed the Kansas City Chiefs 35-10. In fact, the NFL would dominate the AFL until the the third championship game, when a young, upstart quarterback name Joe Namath predicted his New York Jets would defeat the NFL's best team and take the crown away from the incumbent league. The next year, Super Bowl 4 was the first time the championship game used the now famous title. Remember those Chiefs that were crushed in the first big game? Lamar Hunt, the owner and founder of the team and of the AFL itself, had been using the term "Super Bowl" for years. Hunt would later explain that his daughter had a toy called the "Super Ball" and he tweaked the name. The media caught on, and eventually, the unified NFL-AFL did as well. Let's be clear, this was a big deal. It was broadcasted on two networks, who both used their own announcers, not like today. And it wasn't even close to being a sellout. The game took place at the LA Coliseum and out of the 94,000 available seats, a third were empty. The tickets also cost $12. The entertainment also wasn't Beyonce or Lady Gaga, but the University of Arizona marching band. The halftime show starred Al Hirt, a famed trumpeter, and men with jet packs. A lot has sure changed in 50 years.